It's still Keen Day over here, so I'm taking the opportunity to release v1.0 of Omnispeak. Omnispeak is an (almost) complete, bug-for-bug reimplementation of Keen 4, 5, and 6 for Windows and Linux. The downloads include Keen 4 v1.4 already set up, but this release also supports Keen 5 v1.4 and Keen 6 v1.4 & v1.5. To set up another episode, you need to copy the EGAGRAPH, GAMEMAPS, and AUDIO files into the game directory, along with the contents of the data/keen<ep> directory. If you've got multiple copies in the same directory, you can use the /EPISODE <ep> command line option to select one. Omnispeak is also (hopefully) compatible with the savegames from those versions of Keen, so you can copy them back and forth as you wish. There's not much by way of modding support yet. You might be able to get some levelpacks to work, but patches, for example, aren't supported. Joystick support is buggy and incomplete, and neither gamepad or mouse support exists. Some of the debug cheats (notably Demo recording) aren't implemented. The new settings (Fullscreen, Aspect ratio, and Overscan border) aren't saved anywhere. A few internal things in the engine still work slightly differently, though this shouldn't ever affect gameplay. This wouldn't have been possible without the huge amount of work NY00123 and lemm have put in, either. Last edited by Multimania on Wed Mar 15, 2017 16:48, edited 1 time in total. I gave Omnispeak a shot, and I muss say: pretty pretty sleek!!! You guys put a hole lot of work in there too make this feel so smooth. it does what it should and you don't need DOS or any external emulator to run the game. Impressive! what bothers me a bit is that the aspect ratio and the overscan border aren't saved anywhere. but you've already pointed that out. Nevertheless this engine has a whole lot of potential! I'd love to see some mod support for it. this could lift things to a new level. from now on I'm gonna use it as my favored K4 engine. I haven't tested this yet, but I have to say I'm very glad to see a faithful Keen:Galaxy reimplementation. I'm also glad that I didn't waste (too much of) my time trying to create my own Keen:Galaxy reimplementation. Here it is, essentially the whole thing. This time, we used some kind of a dumper that, well, dumps the in-game state and objects once for each PlayLoop iteration. This was done so we could compare demo playbacks of Vanilla Keen 4-6 and Omnispeak. In the Omnispeak codebase, simply look for CK_ENABLE_PLAYLOOP_DUMPER. For Vanilla Keen, there are a few patches in the following link. You can also find a dump printer, which prints each binary dump file as multiple sequences of hex numbers. I surely have no problem with this. Interestingly, you may have possibly spotted that reflection-keen shows the border in games too, although it isn't really used in Keen Dreams (unless MM_SortMem is called for some weird reason). 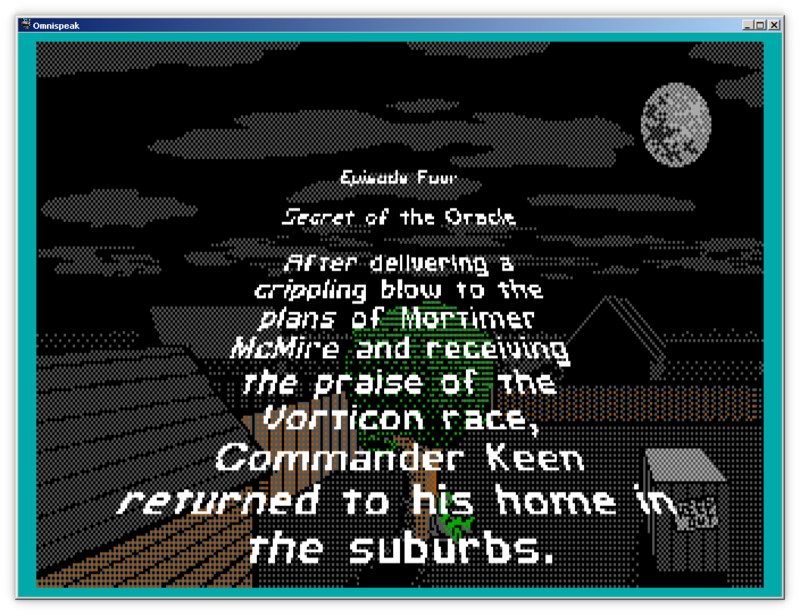 Run Keen better then Dosbox, no random stutters. and even in wide-fullscreen what sorcery is this!? Will there be a command line to select a data folder, it the future? when mod support gets implemented, to keep data files separate. will there be Support for Netkeen or even co-op in the future? and is there possibility of a Android port in the mists? So wait... what do those vanilla patches do? How do I access whatever it is they're doing? As stated above, their purpose is dumping in-game data, once for each call to PlayLoop. Before experimenting with this, though, just one, erm, "notice" is incoming. SOME WORDS OF A WARNING: Be sure you have enough free space. The dumper writes ~7688 bytes per call to PlayLoop (the exact amount depends on the gamestate size, given by the episode number). Assuming 35 calls to PlayLoop per second, this means that more than 15MB may be written under a *single minute*. The rate may be reduced by a factor of 3 for demo recording/playback, but the impact is still there. Note that if you do not redirect standard output, you should expect to see the dumped data as on-screen "garbage" (and possibly also observe some other unexpected behaviors). I've uploaded yet another unofficial update to CKPATCH. It now supports Keen 6 v1.5. In addition, it can be used with the original PKLITE-packed Monster Bash executables (i.e., there's no need to unpack them). It should be compatible with that k6e15dmp.pat file, currently found under omnispeak/tools/kdumper (https://github.com/sulix/omnispeak/blob ... e15dmp.pat).